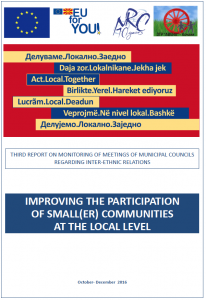 This report was prepared within the project activities “Improving the participation of small(er) communities at the local level” with the support of Delegation of the European Union and Insok. Association National Roma Centrum from Kumanovo (NRC) together with the Association of Roma Avena Kocani, starting from October 1 till December 31, 2016 monitored the level of quality of the sessions and their dynamics, structure of participants in decision-making process regarding inter-ethnic relations, whether the Commission on inter-ethnic relations is functional and consulted and whether their opinions and recommendations have been taken into account, planning and allocation of funds, participation of smaller communities directly or indirectly as citizens. Before you is the third report which refers to the period from October 1 till December 31, 2016. This publication has been produced with the assistance of the European Union. 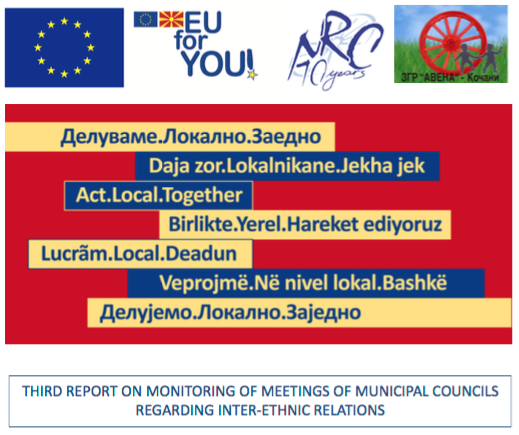 The contents of this publication are the sole responsibility of Association National Roma Centrum (NRC) Kumanovo and the partner organization Association of Roma AVENA, Kocani, and can in no way be taken to reflect the views of the European Union. Through people mobilization and empowerment, using rights based advocacy and participatory approach, NRC will support its constituents (Roma and other people living in social risk) to fulfill their fundamental rights and enjoy their freedoms as equal in the society. Support the development of a society where all people are equal and have equal opportunities to enjoy their freedoms and rights.